Over the weekend I had the pleasure to meet lot of great people and runners. I was going up Friday this time to stay at my friend Joshua http://vagabondrunning.blogspot.com/. Friday night we went out to meet up with BonkProof runner Jonathan Hill for some beet juice, running and running shoe geek talk. Great dinner at Boston Works by Fenway Park. Saturday morning I had planned to do an easy shake our run with strides, as Joshua lives right by the first Newton Hill, we gave that one a shot. Very different to run this hill with fresh legs! After some easy mileage with strides and stretching we went in to Boston and the expo. The plan was to get my bib and then do some damage at the Skechers Performance Division marathon expo. I had a great day talking to runners from all over the world. Did some promotion to Scandinavian runners who has not really seen Skechers GORun shoes yet. Lot of work to do in Northern Europe, hopefully I can help out to spread the word! I always having a great time meeting up with the Skechers Perfromance Division Team! A great team that are really supportive. After the expo I meet up with my wife Erin and the rest of the family at our hotel in Waltham, again had a great dinner. Easy run in the morning, some easy mileage with some strides. Feeling ready. Sunday I had two interviews planned. First with Skechers Performance Division and then Swedish TV4. Unfortunately the Skechers interview got cancelled. But I had a blast doing the SWE TV4 interview. Mostly about my experiences after my finish last year when I most likely meet the two "bombers" but also a lot of questions about this years marathon and security. Late Sunday we finished up with a really nice easter dinner, hosted by our local Cosgrove family. Always a great time to catch up with them! Also the family always helps out to hand off my water bottles along the race course, Thanks Charlie you did a great job! We were back at the hotel around 7PM. I did the last preparations and hit the bed early. Shoe of choice was Skechers GoMeb Speed2. Fuel was Honeystinger gel. Alarm went off 5:30AM, easy breakfast with bagels and oatmeal. Plan was to hit the road around 7:00AM. This year with all security around Boston marathon, we had to go to a different drop off spot as we chose to drive to the start from the hotel. At the drop off we got searched by security and metal detectors. Not a big deal, it all went really smooth. The yellow school bus took us this year to the back side of the school and the "Athletes Village". A much longer walk then I'm used to from earlier marathons. The plan was to go to the Skechers Performance Division house, to relax a bit before the start and to meet up with Team Wicked Bonk Proof and other #GOelite runners. Skechers Performance Division had set up the back yard of the house with a rest room, chairs and some beverages. It was a great atmosphere and great to meet up with guys like Caleb Masland and Seth Hasty. Again walking down to the start you got searched with metal detectors and the police was more present then. Also standing in my corral waiting for start you could see snipers on the roofs. With low mileage in my legs, due to all Hamstring issues I been threw, I had no clue where I was at. It was hot already from the start and the forecast was high 60's. Normally I get fried around 55. I knew I had the best possible shoes for me Skechers GoMeb Speed2 and great fuel 6 HoneyStingers gel.....When start went off I felt it was more crowded the earlier years. I couldn't really find a good pace first half mile, I got a bit stressed out that the first mile would be 7:30+. It landed at 6:53, and I got more relieved and relaxed. The field of runners started to ease up and I got in to my zone trying to hit even splits around 6:45. I felt really strong, trying to have fun. Already from the start I could feel the heat but it did not bother me really. At mile 6 I got my first water bottle,. I kept the bottle for about 2 miles. It was really nice to cruise pass 2 water station without getting into the battle of getting fluids. The miles were ticking and I had great splits, still feeling strong. Wellsley passed by and I had my second water bottle placed out right after the 13.1 mark. Again great to get your own stuff and I kept it for a mile. At this time you start to prepare yourself for the hills. Close to Newton, I saw a familiar runner, Reno Stirrat. Reno had started feel his PF and had decided to slow. Reno is a great guy and I felt really bad for him. I asked if he needed anything like gel, but Reno gently said no and encouraged me to have a great fun race. Reno is a great guy for sure! Hills were coming closer and at this point started to feel the marathon. I had to dig a bit deeper to hit splits in the heat. First Hill by the Newton Fire station was ahead of me. I started to get in to the hill zone and climb the hill by effort. It felt pretty good, but I also started to battle with my mind. On the down hill and flat parts I tried to run relaxed and get prepared for the upcoming tasks but I started to struggle in the heat. I feel I kept decent pace over the hills but I did not recover as I had wished for between them. The last hill is Heartbreak Hill, in the middle of the hill the rumor started to spread out that Meb had won the 2014 Boston Marathon. 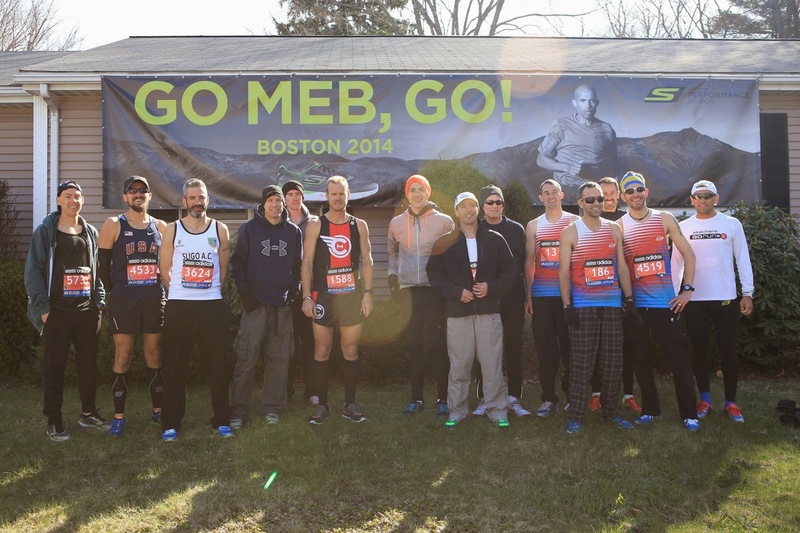 Soon everyone started to scream "Meb won!" I really got a kick out that, very inspiring. I knew I had to dig deeper to finish strong. Heartbreak Hill passed and i knew from this point its mostly down hill. I tried really hard to pick up 6:45 splits but my legs did not respond. The splits came closer to 7:00. I started to pick out strategic goals to keep me going. Mile 25 was the point were my wife Erin and family would be. 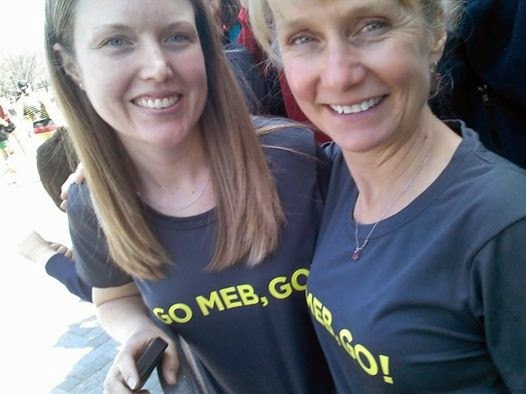 Erin and Kim cheers on all #GOelite runners! Plan was to keep pace up and hopefully drop a few faster ones. I passed Erin, always so great to see her! Now I started to feel some cramp building up in my hamstring. I was thinking "please no". A split second later I had to do a fast stop, by a cop. Who helped me stretch my left hamstring. On to Bolyston Street and what a feeling! Crowd was amazing. Hamstring was OK , no more worries and I pretty much just sucked in everything I could. By the finish line I got the opportunity to "high five" one of the heros from 2013 Boston Marathon Carlos Arredondo, what a great way to finish my 2014 Boston Marathon. I was happy to get to the start line healthy this year and couldn't be more proud of myself and how this marathon turned out! 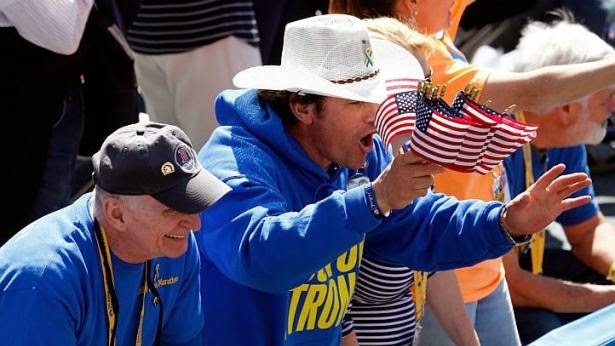 With Meb winning the Boston Marathon and how the runners and the crowd really took back the streets of Boston! 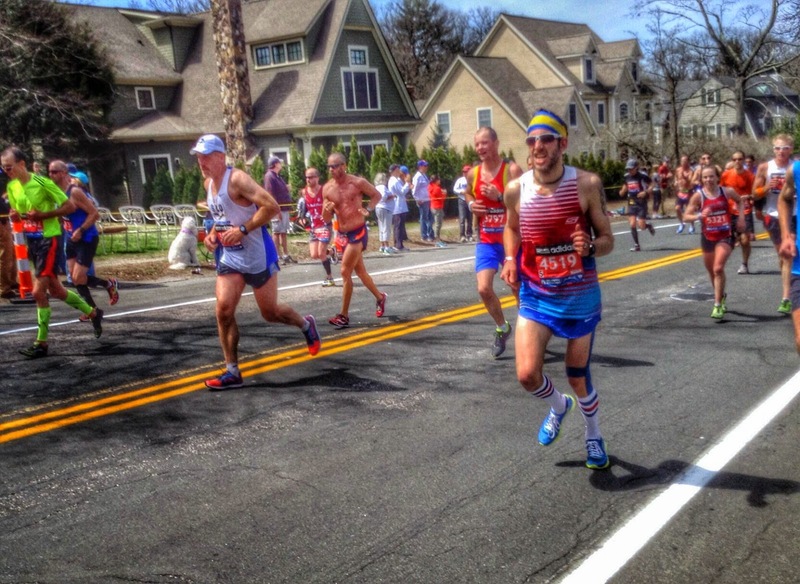 2014 Boston Marathon will always be one of my "best"marathons! congratulations stefan - great race, great report, great results! you are an inspiration and a fantastic Skechers ambassador! Congratulations to you! #bonkproof ! !